Until 1993, there were three basic styles of powered wheelchairs on the market: The traditional style, the mid-wheel drive and the power base powered chair. The most common design in use today, is really a toss up but I would say the mid wheel and rear wheel are the more common than the traditional style. These chairs usually are powered by a battery attached behind or underneath the seat of the wheelchair. The platform-model powered chair consists of a seating platform located atop a power base. A variation on the power base concept is a chair that includes built-in lifts to allow the user to raise and lower the seating platform. A powered wheelchair must be selected carefully in order to ensure it not only meets the needs of the individual who will use it but also represents good value for the money being invested in it. Physical considerations for choosing the proper power wheelchair include posture, strength, sensation, visual acuity and perception, and the ability to learn how to use the wheelchair safely. A functional evaluation should be done including actual use of the wheelchair in everyday settings; an evaluation of the individual's ability to get in and out of the wheelchair; and the ability to perform needed activities from the wheelchair. Another consideration is the user's prognosis; if they have a condition that is likely to deteriorate it is important that the chair will be able to continue to work for them without too many modifications. While the person's physical capabilities and functional capacity clearly are important factors to consider, it also is essential that the wheelchair selected "fits" the individual's lifestyle. For example, if it is to be used both in the home and at work (or school) both environments must be architecturally accessible. If the person cannot get into the bathroom using a particular wheelchair, that chair is not a practical alternative for that individual. Transportation to and from various settings also is an important consideration: Is a van available to transport the individual in the chair, or is it necessary for the chair to fold or disassemble in order to be carried in an automobile trunk? Another important consideration, and one that has not received much attention until recently, is personal style. Because powered wheelchairs generally are used by people with severe disabilities, function has traditionally been stressed over style. However, consumer demand for improved appearance of powered wheelchairs has led to an effort on the part of manufacturers to develop aesthetically appealing powered wheelchairs, some in a selection of colors, and most with more streamlined designs. Many traditional-style models utilize the traditional cross-brace frame which allows the chair to be folded or collapsed for storage and transport once the batteries have been removed. A large number of power wheelchairs, however, are designed to be transported while carrying the user; consequently, they do not fold or disassemble. One of the biggest breakthroughs in wheelchair technology has been the development of new, lighter-weight materials for wheelchair frames and some of these materials are now being used for powered wheelchairs. Traditional-style chairs now have frames made of steel, cold-rolled steel, tubular steel, chrome-moly, and aluminum. Power base chairs may have aluminum, stainless steel, cold-rolled steel, flat steel, tubular steel, or steel frames. The type of material used to construct the frame affects the weight of the frame, and therefore the overall weight of the wheelchair. The type of frame material also can affect the wheelchair's overall strength. While some of the materials used may result in powered chairs being relatively lighter weight than they have been in the past, it should be noted that powered chairs are still considerably heavier than manual wheelchairs, with weights ranging from 85 pounds to more than 300 pounds. Seating systems are sold separately from the wheelchairs themselves, as seating must be chosen on an individual basis. It is important when selecting a wheelchair or a seating system to ensure that the two components are compatible. Traditional-style rear wheel drive chairs generally use the standard four-wheel configuration, with two large wheels at the back and two smaller ones (casters) at the front. The standard tire used for the rear wheels on most wheelchairs is a pneumatic tire. Casters, too, vary in size (generally ranging from six to eight inches in diameter, although smaller sizes are also used) and composition (pneumatic, solid rubber, or foam filled). These chairs may have pneumatic, semi-pneumatic, or solid tires but pneumatic are the most common. A variety of foot rest assemblies are available on all types of wheelchairs. They may be a 90° platform, elevating swing away or swing way flip up foot rests. The swing away flip up foot rests are usually available in 90°, 70° and 60° configurations depending on the needs of the user although the 90° versions usually only work for children. Arm rests also come in several styles or with a combination of features. They may be full- or desk-length, or wrap around, and they may be fixed, removable, pivoting, and/or adjustable height. Powered chairs generally include as a standard feature a manually controlled joystick to regulate the chair's speed and direction. However, most manufacturers offer customized control options to accommodate the varied abilities of the user, including sip-n-puff systems, head and chin switches, push-button controls, trackballs, and tillers. Many chairs also have programmable control features which allow the user or a dealer to adjust or set the chair's speed and control limits as the user's abilities change. There are also manufacturers who do not make wheelchairs, but who offer specialized control systems for powered wheelchairs, including voice-activated controls. When purchasing controls and switches from a source other than the chair's manufacturer, it is essential to determine that the selected control is compatible with the chair. Batteries are a determining factor in the range and power of a powered chair. Generally, the larger the chair's batteries, the greater the power and the longer the chair's range between charges. Most chairs require two rechargeable 12-volt batteries. The most common battery sizes are, from smallest to largest, U1, group 22 or 24 batteries. The type of battery required is also an important consideration in terms of safety, maintenance, and transport. Powered chairs may utilize lead acid, gel cell, or sealed wet batteries Although the gel cell batteries are by for the most common. Gel cell batteries require the least maintenance and have less danger of leaking than do the other battery types. Gel cell batteries are also required by a number of airlines when transporting powered chairs. When purchasing a powered wheelchair, the user also should consider whether batteries are included with the chair or whether they are extra-cost items. Another consideration is the range or distance a chair can travel between charges. Although factors such as the user's weight, additional powered features, speed, and the type of terrain on which the chair is used will effect the range, manufacturers indicate the range that can be expected from a power wheelchair however their estimates are based on perfect conditions and tend to be optimistic. It is important that the chair's performance meet the user's needs and expectations. High end power wheelchairs are often have features that make their use possible to many people who have needs beyond those who are simply unable to walk. 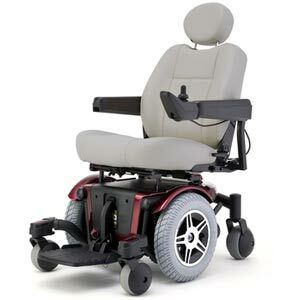 Features such as specialty drive controls to allow for alternative drive options from the standard joystick, power tilt and/or recline seats, power elevating seats, power leg rests, and power stand-up frames are all available to enable use and extend seating tolerances and comfort. Anyone who has purchased or is considering the purchase of a powered wheelchair should be aware of the expense of buying and maintaining them. The purchase price of a powered wheelchair rarely is less than $4,500; for the more deluxe models or those with specialized adaptations, the price can exceed $12,000 and be as high as $20,000 or more. Thus, a powered wheelchair is a major financial investment. Like any major financial decision, purchase of a powered wheelchair should be undertaken with the utmost care to ensure the product meets the needs of the individual who will be using it. In Ontario, some of the common sources of funding are The Assistive Devices Program (Ministry of Health), Ontario Disability Support Program, March of Dimes, MS Society, Local Community Service Clubs, Private Extended Health Plans, Department of Veteran's Affairs and Non-Insured Health Benefits (First Nations Members).